Snaking for 12 miles (19 km) from the southern ice field of Patagonia to the iceberg-filled waters of Grey Lake, the Grey Glacier ranks among the most spectacular natural attractions within Chile’s Torres del Paine region. 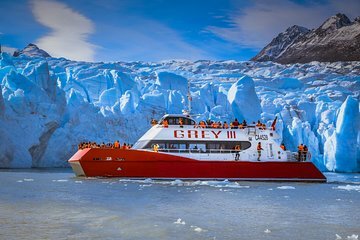 With this tour, you’ll see the impressive wall of ice from the closest vantage point possible aboard a boat. Sip on a typical pisco sour as you take in the views.